It's time to admit it: Jon and Dany totally have feelings for one another on "Game of Thrones"
No witty jokes here, just a serious warning. If you haven’t seen the latest Game of Thrones episode, “Eastwatch,” you’d best be scooting somewhere else because we need to talk about it and there will be spoilers. 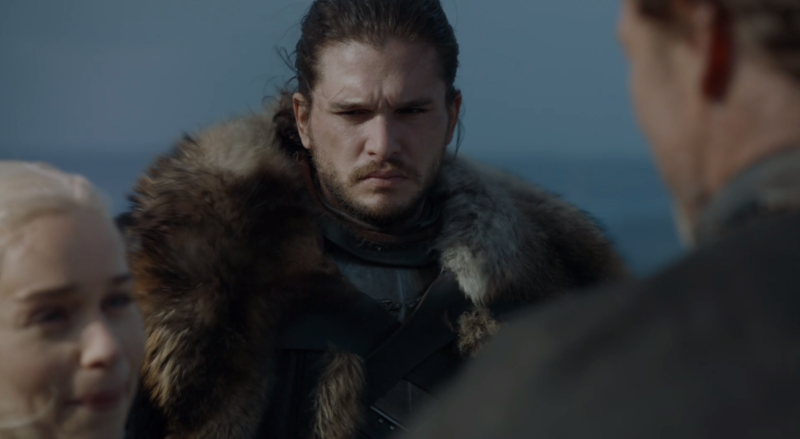 For the past few weeks, ever since that very first meeting between Jon Snow and Daenerys Targaryen, there’s been some *serious* sexual tension. I noticed, you noticed, even Ser Davos noticed and being senior advisor/hip surrogate dad to Jon Snow, he was totally on board. In fact, it seems that the only two not willing to admit to their budding feelings are Jon and Dany. Jon needs Dany to help with the White Walkers, Dany wants Jon to bend the knee. Neither has complied just yet, and it is frustrating *all* of us. They consulted their advisors and realized they needed to make an effort to get to know each other, resulting in a beautiful exchange, with Dany allowing Jon to mine dragonglass. Putting their egos and tensions aside leads to one of *the* best scenes between the two: A romantic trip into a cave, looking at wall paintings from the Children of the Forest. TBH, Jon “Has No Game” Snow missed out on the perfect opportunity to convince her that the White Walkers are real AND have an A+ Bachelor date. You know nothing, Jon Snow. While Jon continued to be oblivious, Dany clearly felt something in the cave because just a few minutes later, she was asking for Jon’s advice on war strategy. And, of course we can’t forget about *that* moment between Jon and Drogon. This is all building into something beautiful — but then someone from Dany’s past, aka Ser Jorah Mormont, swooped in, freshly cured of greyscale. Fans of the show know that Jorah had been ordered by his Khaleesi to find a cure for his greyscale and return to her. He obviously fulfilled his mission and Dany is thrilled. Guess who was not feeling it: Jon Snow, King in the North. Jorah arrives and you can *literally* see the look on his face asking, “Wait, who is this?” as Dany and her former advisor reunite. But just when we thought things might get really interesting on Dragonstone — hey, it’s been a little bit since the Daario/Jorah/Dany love triangle — Jon decides he needs to capture a wight to prove to Cersei that the army of the dead is coming and temporarily stop the war between Cersei and Dany. Naturally, Jorah volunteers for the mission, because he’s here to serve his queen, which Dany allows. But when Jon announces he’s leaving to lead the mission, Dany very much objects. Nevertheless, Jorah and Jon (along with Gendry and Ser Davos, but this isn’t about them) depart for The Wall and Dany is left on Dragonstone without any of her potential boyfriends. This is where we’re currently at: Dany and Jon are totally in love but are not willing to admit it. Their partnership is a pretty solid strategic move as well and it wouldn’t surprise us if that comes up in the next few episodes. Sure, Jorah’s presence certainly threw a wrench in Jon’s long game — it’s the only game he has — but assuming both of them survive the death mission beyond The Wall, we think Dany + Jon will win out.